In Late May of 2016 my wife and I sailed on the S,S. 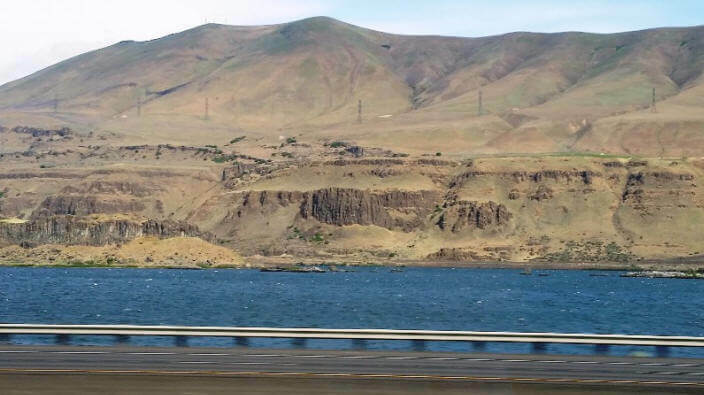 Legacy on the Columbia and Snake River itinerary. 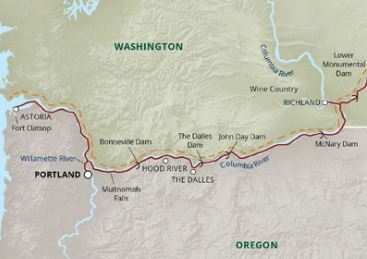 It was titled the Lewis and Clark – “Legacy of Discovery” and covered the Expeditions route on their final push to the Pacific Ocean. The cruise was in no way as punishing as the Expedition encountered and was in fact a very pleasant way to see what is a most amazing contrast of different scenery and conditions as you cruise through the many gorges and locks which raise the ship over 700 feet as you sail through the green mountains to arrive at the desert, east of in Lewisville. Our cruise had an extremely knowledgeable guide who travelled on all the shore excursion tours (all tours being included) with the passengers and besides being very well versed on the Expedition he also had enlightening snippets of historical facts and artifacts to help bring alive the condition and difficulties the Lewis and Clark Corps of Discovery team had to deal with on what was basically the same route we were following. and culture of a particular region. 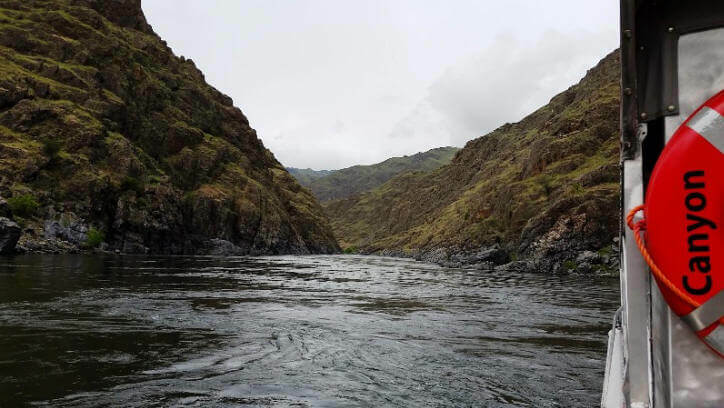 This style of cruising is comparable to the paddlewheel-style of cruising that flourishes on U.S. rivers and is perfect for those looking for an intimate, low-activity adventure, heavy on history and enrichment and the S.S. Legacy has succeeds in offering just that. There is no casino, lido deck with swimming pool or round-the-clock buffet. Passengers create their own entertainment, which isn’t hard to do, considering the ship’s capacity. Passengers quickly make friends, and a cruise can start to feel like a family reunion. There are two hot tubs and some work out equipment as well as some pleasant quite areas on deck where passengers can pass the time watching the impressive scenery go by, reading or organizing their many photo images on their ipads. Back on board from an afternoon of sight-seeing or whatever usually meant a stop in the lounge for happy hour where hors d’ouvres are set out and the cocktails circulate. (Bear in mind that the ship offers and open bar policy for 24/7 and there are virtually no restriction on what and how much is consumed). Meals become almost a ritual with many passengers staking their claim to the tables that have the best views. All meals (except “early riser’s breakfast” – served in the lounge) are served in the dining room which is open seating, which also makes for closer acquaintances or a way to easily carry conversations from the lounge to the dining room. Not having to choose an assigned seating time or feel obligated to sit with the same tablemates is definitely a highlight on this ship, as is the food, which almost always includes fresh regional options and something to cater to dieters.The service is just as pleasing. The crew are generally a hardworking, pleasant team of young professional hospitality types who always have a smile and are willing to make the effort to ensure each passenger feels they are in some way special. 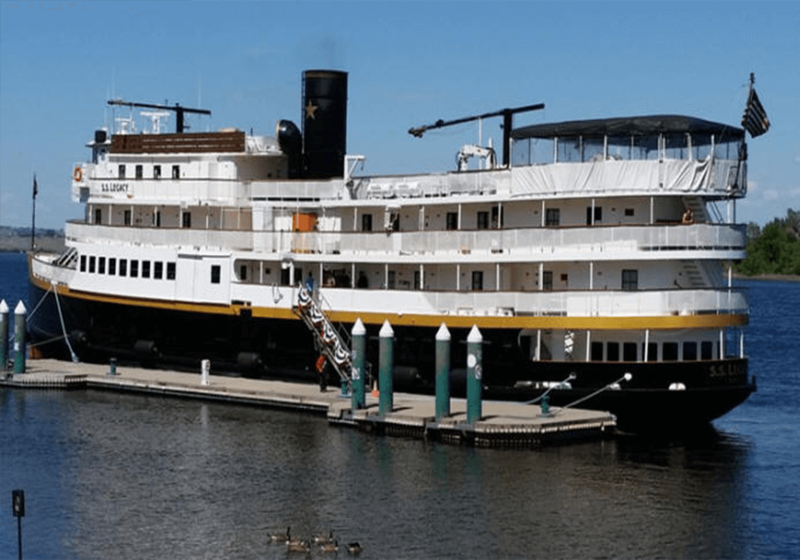 Un-Cruise Adventures purchased the 88-passenger ship and transformed it into an expedition ship reminiscent of a turn-of-the-century coastal steamer. S.S. Legacy looks and feels more like an old Victorian vessel than what one might envision from a standard expedition ship. During its extensive makeover, the ship was given a new life while preserving details like the original layout of the dining room. There’s a quaint, old-timey feel throughout; you’ll see it in details such as the Western decor of the Pesky Ballroom saloon. 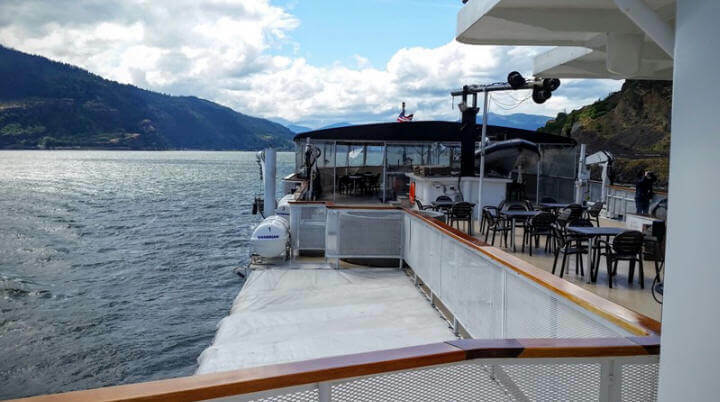 S.S. Legacy has sailed Alaska itineraries, but it primarily sails on the Columbia and Snake rivers in the Pacific Northwest which was the itinerary my wife Carol and I sailed. Cruises include all food, alcoholic beverages, excursions and enrichment, plus one massage, only gratuities are additional and range from 7 to 10% of the cruise price. The ship is a smallish vessel of around 200 ft in length, staterooms vary in size from category to category as one would expect on a small ship mechanical noise can be a problem particularly if your stateroom is in forward end of the ship. S.S. Legacy Dress Code was something we struggled with as the weather on this route can be and is so changeable, cool and damp once the ship leaves Portland and hot when she is in Lewisville. Casual is the key however, with layers being the answer. Because of the ship’s presence in the Northwest, where rain and cool temperatures are common. The atmosphere onboard is relaxed; passengers typically head to dinner in something similar to what they wore on their excursions. You’ll see a lot of long pants, rain jackets, hiking boots and hats. There are no formal nights; in fact, passengers are encouraged to dress down at times. There is a captain’s dinner at the end of every cruise in which passengers have the option to break out the one nice sweater they packed, but are not required to do so. For Worldwide’s clientele – the S.S. Legacy would best be utilized as a small expedition charter ship option. Carrying just 88 passengers and doing interesting itineraries she would be attractive to those looking for a soft adventure experience within the United States. This report was prepared by James Castle on May 24, 2016. The views expressed as solely those of the author and not necessarily those of WWTCA.